The new software has been sponsored by OSTC, a world leading proprietary trading company, and was organised by OSTC’s Brighton Office Managing Director Sam Baker, a University of Brighton graduate. Students can now trade in all major asset classes including commodities including cocoa, sugar coffee, and in energies, currencies and interest rates. Sam, who graduated in 2003 with Business Administration BA(Hons), has been closely involved with Brighton Business School and the Student Trading Society for six years. Speaking at the opening of the School’s new trading room at Moulsecoomb, Brighton, he said: “As a proud graduate, it is a genuine privilege for me to give something back to the next generation of students. “As a company, our vision is to maximise the potential of every trader and every trading opportunity. This new room will help achieve that aim – giving students both a taste of the industry and the tools they need to become the trading stars of the future. 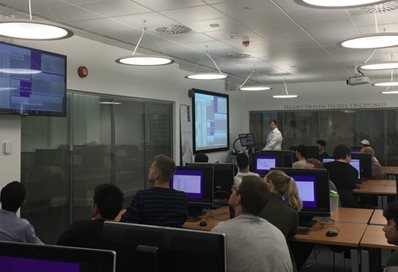 The Stellar Trading System has been installed in 20 computers in the trading room, making the university the only institution on the south coast with the software. 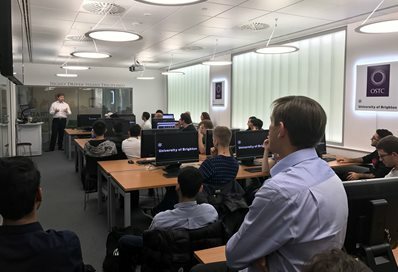 Members of the Student Trading Society, staff and other alumni attended the opening of the trading room which offers students practical, hands-on experience of trading as part of their degree courses. It can also be made available to students for private investment and trading experience. The software is used by OSTC in their 14 offices around the world and provides access to all of the largest futures exchanges. Students will be in a simulated environment but they will be able to trade using the live prices that OSTC have available for their own transactions. And Rob Hayward, Senior Lecturer in the Brighton Business School, said: “Our partnership with OSTC ensures our students get experience of financial market practise, and access to a global trading company. A number of our former students are now working at OSTC and we hope more will join them in the future. Tagged alumni, Careers, finance and investment, Industry, OSTC, trading. Bookmark the permalink.